Although not yet an official member, I love dressing up every year for the Academy awards; whether it be black-tie, PJ’s, or casual Sunday. On seeing a few shots of the great Benedict Cumberbatch in the audience as a nominee, I stumbled upon this picture. 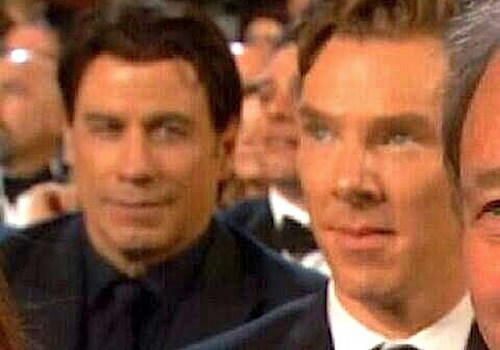 Now, don’t get me wrong: Travolta’s got the crazy eyes, no doubt. But for Cumberbatch…doesn’t he deserve some credit, some recognition for this great Brit thesp? I suppose that I felt that I could relate, and mulling it over I came up with a recipe, albeit a screwy one, that best summarizes him: the Eggs-Benedict Cumberbatch, of my own creation. 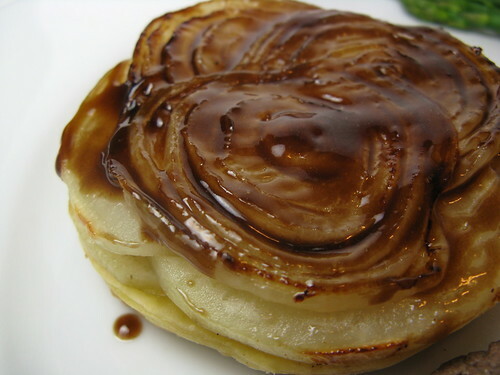 Through a step-by-step take, I’ll show you just how it’s done! You were the result of skipping the gym this morning, and I have to say, I’m glad I chose you. It was the perfect opportunity to have breakfast on my new china I found at the flea market, enjoy French press coffee and read the newspaper. Reading the newspaper is such a luxury these days, and I relish every opportunity I have to sit and appreciate it. The stars of the meal were local, soft-scrambled buttery eggs, Rehoboth Ranch uncured smoked bacon, and Empire Baking Company sourdough toast (picked up from Patina Green Home and Market). If I had it my way, I’d enjoy mornings like this every day.